Bainbridge Island takes its sidewalks seriously. I got the weather all wrong. I checked the forecast yesterday and it said there was a chance of rain in Seattle tomorrow, as in Saturday. Today was supposed to be partly cloudy and 70 degrees. If I’d looked at the weather report before I left the hostel this morning, I wouldn’t have stashed my nifty lightweight rain shell with my other stuff in the hostel’s storage place. Today’s my day to be loose in Seattle, before I catch a train for Bellingham early tomorrow morning. I decided to take the ferry over to Bainbridge Island, because I’ve never been there before. (I always go to Vashon, where my family is.) I got off the boat and it started to rain and I was completely perplexed. It’s like I didn’t remember what to do when water falls out of the sky. I sat down on a bench under an awning and was about to call Stewart and then I was, like, wait, why are you doing that? It’s wonderful to be married to someone I want to call every time life surprises me, but this was just some rain. Look. Over there. The little thing floating above that woman’s head is an umbrella. You could get one of those. Or a four dollar poncho like that other lady pulled out of her bag just now. You could probably find one of those in the drug store, in the “Things for Dumb Tourists” aisle. I think one of the reasons I wanted to take this trip by myself is so I could be less protected, so I could remember how to solve for a set of life’s confusions — even small ones — on my own. Maybe that’s why I decided my preferred option was to just let myself get wet. 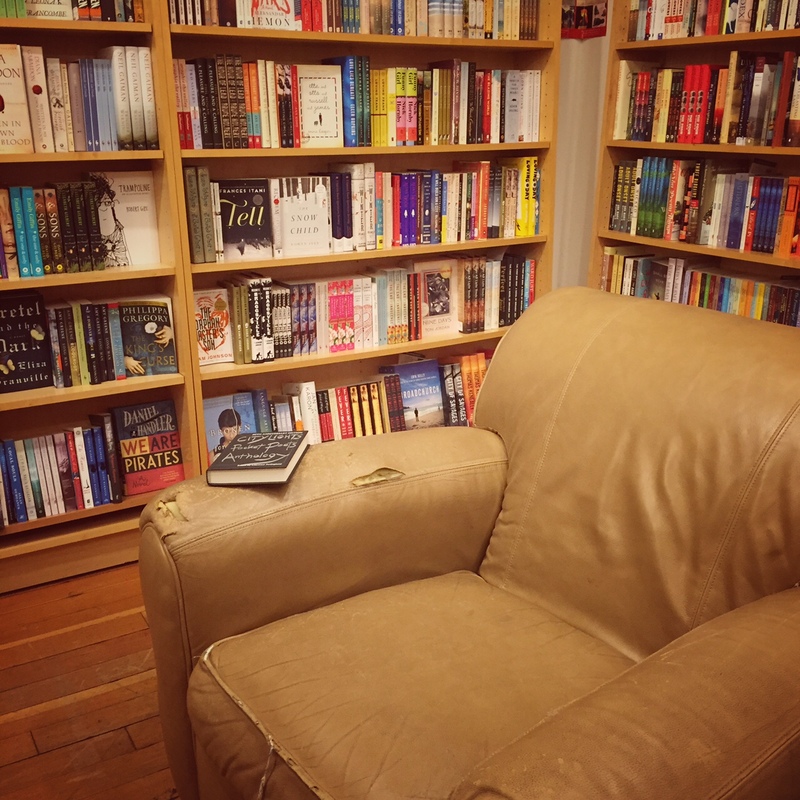 But first I spent some time in this fat leather chair in the local independent bookstore. This ripped chair felt like an exception to the upscale Bainbridge vibe. I crawled right into it. The downtown area of Bainbridge is sweet. It has shops named Lark and Plum and Heart. It’s hard for me to tell places like this apart. I think the woman who once complained to me that “Vashon is so artsy“ would like Bainbridge better. Vashon has more tie-dye. Bainbridge has more things that are scented. It may say something about Bainbridge that one of the first things I saw when I walked into town was a young man on his hands and knees cleaning the sidewalk with a small wire brush. Nearby, there was another guy with a power washer and one with a motorized scrubber. I noticed they were working in front of a construction site and I figured that had something to do with it, but when I walked back in that direction an hour or so later — in the rain, getting wet — they were still at it and had progressed to the front of the next building. I watched them for a while. If they saw me cringing, would they have guessed I’m from California? I feel guilty when I accidentally squirt the patio with a garden hose and here they were power washing a sidewalk in the rain. (Also there was a man who came by in a truck with a water tank, in the rain, to water the lush hanging baskets that line the whole street.) It took me a few minutes to realize I could ask them why they were doing that. I walked up to the guy with wire brush. He was a tall kid with a blond crew cut wearing a short-sleeved shirt and an orange safety vest. The rain wasn’t bothering him. 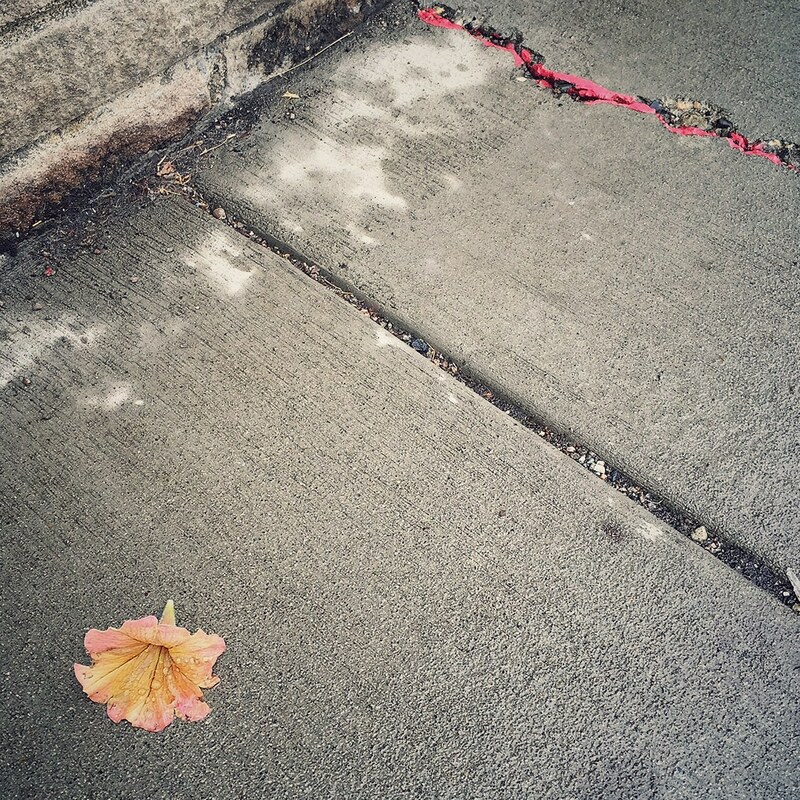 I looked down the main street to where the sidewalk ended. When viewed from the perspective of the little brush in his hands, it seemed far away. I kind of wanted to say something like, “Christ, that’s dumb,” but he was just a kid doing his job. Sweet, sweet rain. The wind and rain blew some branches off of a very big old tree here on Cortes along the road and just put our power out and caused Sylvie and Noella to have to turn around and take several miles of detour to get into our driveway so they didn’t drive over possibly live electrical wires on the road. And i had to take my tent down. We are having more wind than rain here. Enjoy Bainbridge Island. I’ve yet to get there. Love your descriptions. I wonder whether that’s the storm that’s scudding down this way — getting weaker as it goes along. When I did look at the weather report, the front seemed to be moving toward Seattle from your direction. Stay safe, friend, and don’t blow away! I am greedily eating up each and every one of these entries, Shae. The best. Thank you, Jules! I’m enjoying giving myself time to write. And I’m afraid it’s all I got to give you to eat since I stopped making jam! I applaud your challenge to ”go it alone”. your descriptions and observations of Bainbridge island ..inspirie me to want to see it. all those clean sidewalks. gee whiz!!! When I went to VASHON isle some yrs ago. I loved it. could live there..and ride the boat over to seattle happily. yes…your writing makes me want to read more..and follow your adventure. in the good-ole-summertime. I could see you being happy on Vashon, Linky. It’s a sweet, sweet place. I hope you are enjoying your summer, too! That sense of efficacy and competence, of being less protected, is part of the reason I love to travel. Glad you are having such great experiences!